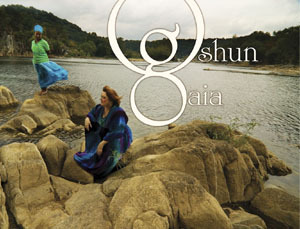 Oshun Gaia is a new recording by Amikaeyla Proudfoot Gaston & Ariana Lightningstorm of Ancient Indigenous Chants and Original Songs from global traditions and spiritualities. This recording was created with the vocal and musical support of the members of KIVA, master drum circle facilitator and teacher Jaqui MacMillan, master bansuri flautist John Wubbenhorst, master drummer Ken Anoff, master middle eastern drummer Daveed Korup, Sarod player Wynne Paris and the wonderful cover and insert art done by Steve Parke. If you download a song or the whole CD and want the lyric sheet you are in luck! Click below to download the PDF files of our CD Insert.